In the second round of the 2011 NFL draft, Ozzie Newsome and the Baltimore Ravens drafted Wide-Receiver Torrey Smith out of the University of Maryland. Smith was an excellent weapon for the franchise quarterback Joe Flacco. Flacco who the Ravens drafted because of his strong arm, now has a receiver who posed as a downfield threat to opposing defenses. Torrey Smith went on to become of the most dangerous receivers in the history of the Ravens during his four year tenure. He catch 213 passes for 3,591 yards and 30 TDs. Smith, a free agent after the 2014 season, signed a 5-year deal with the San Francisco 49ers. When Torrey Smith joined the Ravens,there were immediate concerns that he was not catching on the offense quick enough. Because of that, the Ravens traded a 4th round draft pick to the Buffalo Bills for wide-receiver Lee Evans. Evans who was also a downfield threat was sidelined early due to injury. In week 3 of his rookie season, Torrey Smith officially earned his colors as a Baltimore Raven. He caught 5 passes for 152 yards and 3 TD passes. Those 3 TDs are still a career high today. On this day, Ravens fan knew that the offense would be just as big of a threat as the defense. While Smith continued to be a threat to opposing defenses, perhaps his biggest catch in his career, also became a moment Ravens fans will never forget. November 6, 2011 Ravens visit the arch-rival Pittsburgh Steelers and this was a game where the winner would gain control in the division race. The Ravens, down by 4 needing a TD to take the lead late in the fourth quarter. Flacco looked to Smith on the far left end zone to make the game winning TD catch, but the ball hit his finger tips and hit the ground. Trusting his receiver, Flacco went to Smith again, this time on the far right side and Torrey Smith made the game winning TD pass sending every Ravens fan off their couch into the air full of joy as the Baltimore Ravens defeated the Pittsburgh Steelers at Heinz field. Torrey Smith’s sophomore season began with tragedy. His younger brother, Tevin, died in an accident the night before a primetime game against the rival New England Patriots. Smith decided to honor his brother by going out and playing. While playing with a heavy heart, Smith made younger brother Tevin proud catching 6 passes for 127 yards and 2 TDs. 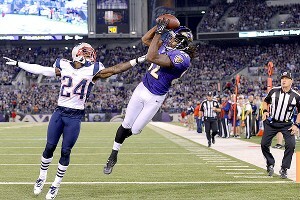 The Ravens went on to win that game, thus avenging their loss in the 2011 AFC Title game. 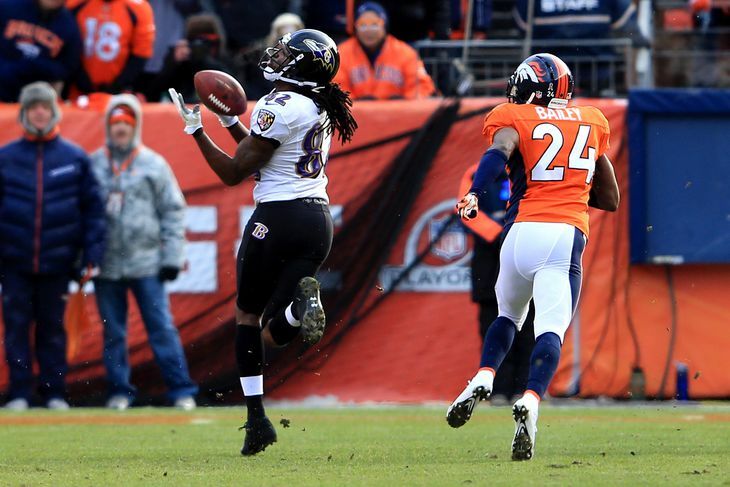 In route to becoming the Super Bowl Champions, the Ravens faced the number one seed Denver Broncos. The Broncos were the heavily favored team to win the Super Bowl after acquiring Peyton Manning in the offseason. In his best playoff game to date, Smith caught 3 passes for 98 yards and 2 TDs. 2 of those TDs came with Smith using his speed to blast right past All-Pro defensive back Champ Bailey. Like Torrey said, the business of football is too crazy for my liking as well. Perhaps the last sport where the front of the jersey means more than the back, its no secret that Torrey Smith is my favorite wide receiver every to wear a Ravens uniform. 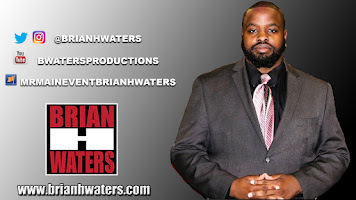 When Ray Rice was released from the team, he became the new face of the community. Did he catch every pass thrown his way, no, but with the arm that Joe Flacco has, Smith was a great weapon to go down field. At any given time, the combination of Flacco-Smith could change the game in a heart beat. There may be receivers who catch better, who run faster, who are stronger, but I guarantee there will never be another Torrey Smith. 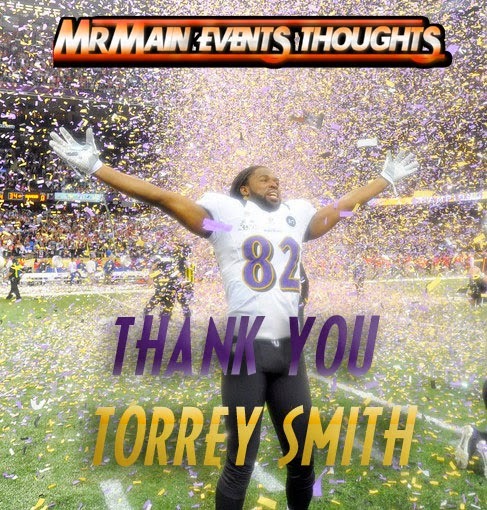 Thank You Torrey Smith for the memories. Labels: Baltimore Ravens, Football, NFL, Super Bowl XLVII Champions, Torrey Smith.